The home at 943 Kings Highway West in Fairfield. FAIRFIELD — There’s something to be said about living in a private setting away from the traffic, noise and crowds of central suburbia, where houses are a bit closer together than in the countryside and the lots a bit smaller. There’s something else to be said about the convenience of living in the midst of local amenities and recreational facilities while also maintaining privacy. 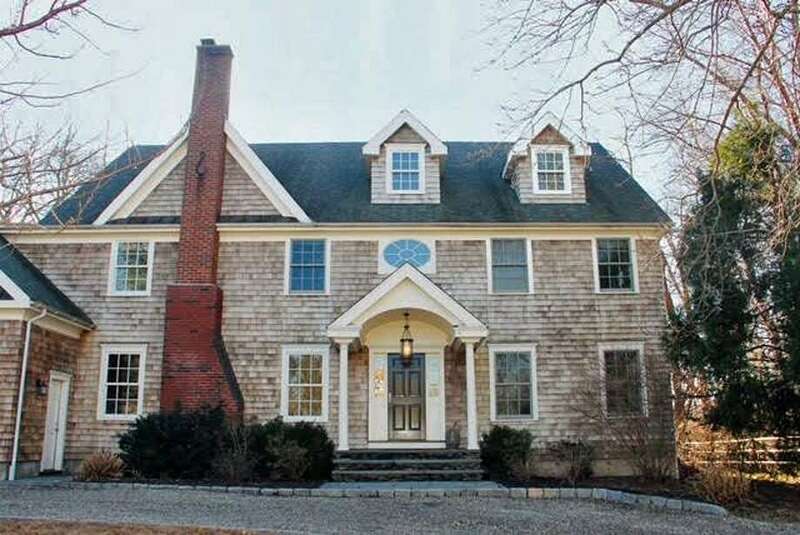 The natural wood, shingle-style colonial house at 943 Kings Highway West, in the Southport section of town, offers that and more. It adjoins the Kings Highway West/Sasco Creek Marsh Open Space area, where the homeowners can canoe or kayak down to Southport Harbor and Long Island Sound just over a mile away. Along the route, they also access the Westway Road Open Space and then the Aspetuck Land Trust/Southport Beach property. The location of this house puts its owners within walking distance to the Southport train station, Southport Village, and local eateries including the Gray Goose Cafe and Artisan — the restaurant in the luxurious Delamar Hotel. It is also a minute away from the Post Road (Route 1), the entrance to Interstate 95, the Pequot Library, Equinox fitness club, the Wakeman Boys & Girls Club, and to a large grocery store in Westport. This 10-room house stands in the footprint of a home that was originally built on this property of just under half an acre in 1931. It was totally rebuilt in 2006; the updating and renovating project conducted by the current owners created what is virtually a newly constructed house perfectly suited to today’s lifestyle. It comprises 3,957 square feet of living space on three finished floors. The walk-up heated attic could be finished to create additional living space, if necessary. It contains a roughed in bath. A semi-circular gravel driveway lined in Belgium block provides additional parking in addition to the attached two-car garage. Inside, French doors open from the foyer into the formal dining room, which features a fireplace and the boards of the hardwood flooring arranged in a subtle, visually interesting pattern rather than the standard straightforward installation. Another set of French doors open into the formal living room. In the sizable family room there is a fireplace, a wall of built-in bookshelves, and a wall of floor-to-ceiling windows with sliding doors to the bi-level bluestone patio surrounded by a stone sitting wall. The family room opens to the newly renovated gourmet eat-in kitchen. It features a center island/breakfast bar, quartzite counters, a walk-in pantry, and sliding doors to the same patio and backyard. High-end appliances include a Viking Professional range, wall oven, and warming drawer. In the eat-in or breakfast area there is a built-in hutch with a wine rack, open dish storage racks, dry bar area, and glass-front cabinetry. The mudroom has cubbies with storage above and below, a closet, and other storage. On the second floor, there are five bedrooms and a study or homework room. The spacious master suite features a fireplace, walk-in closet, and sliding doors to a private balcony. The master bath has a marble floor, double vanity, shower with a rain showerhead, and jetted tub. On the finished lower level there is a fireplace, an arts and craft room, and a sports and fitness room with reinforced walls for indoor training. For more information visit www.JillianKlaffHomes.com or to set up an appointment to see the house contact Sally Bohling of Jillian Klaff Homes/William Raveis Real Estate at 203-856-9185 or Sally.Bohling@Raveis.com.